You want a one-of-a-kind gift; call Mecca’s Marcy Patterson-Grudzien. Using her trademark felted-sweater leaves, vintage flowers, found objects, ribbon and glitter, Patterson-Grudzien creates personal keepsake boxes tailor-made for the fun and funky people on your list. Can’t wait the couple weeks for a custom order’s construction? 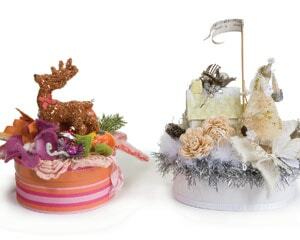 Shop her readymade boxes and cake toppers. Mecca, Benzonia, 231-882-2583.